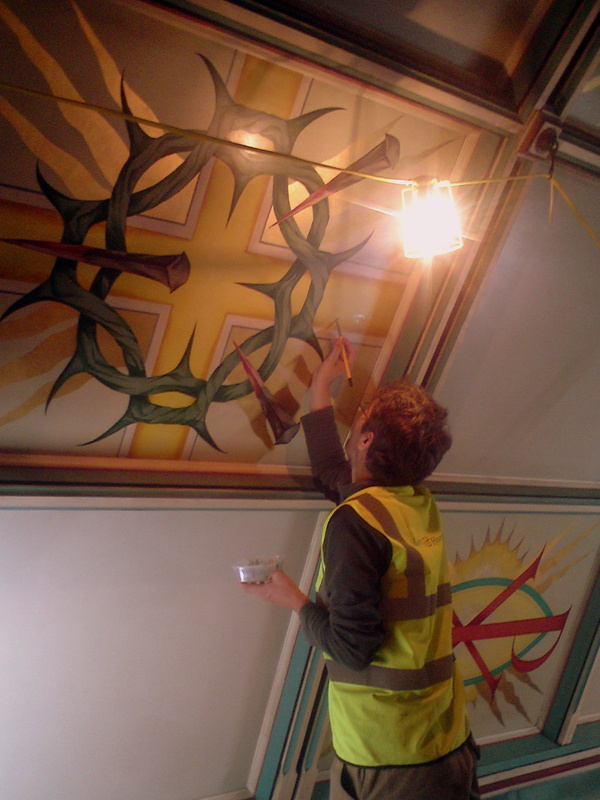 After the Queen’s Jubilee Bank Holiday I went back to work, this time for Hare & Humphreys Ltd. Our job was to clean a painted ceiling and a large crucifix in the Sacred Heart Church in Kilburn, North London. 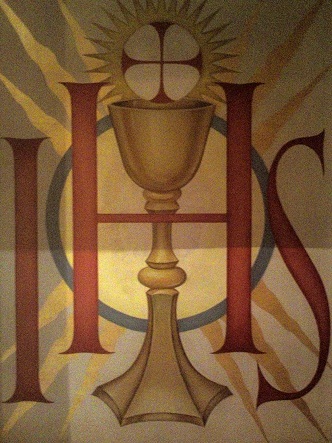 The ceiling was created in the mid-20th Century and was covered in a layer of dust and grease from candles and incense used in the church. Following trials we proceeded to clean the panels. Above you can see a ‘before and after’ example of our work. 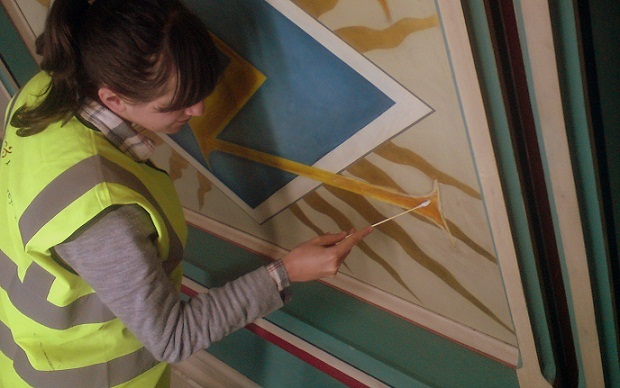 After cleaning the painted panels we discovered that at some point in the past the ceiling had been cleaned using a substance that had removed some of the paint. 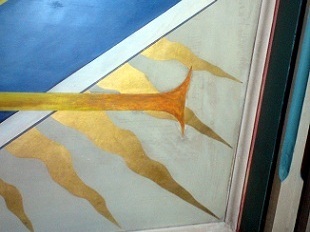 Attempts had been made to retouch the panels but now that the ceiling was clean these looked quite crude. 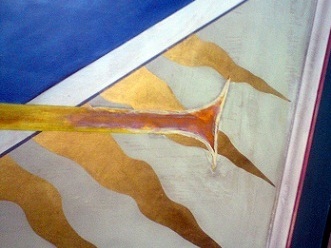 It was decided that we would remove the new paint and retouch these areas again. Although I have some experience of painting I explained to James, my colleague, that I wasn’t too confident when it came to mixing colours. James gave me some tips and demonstrated how it was done and I was very pleased with the effect I was able to achieve. 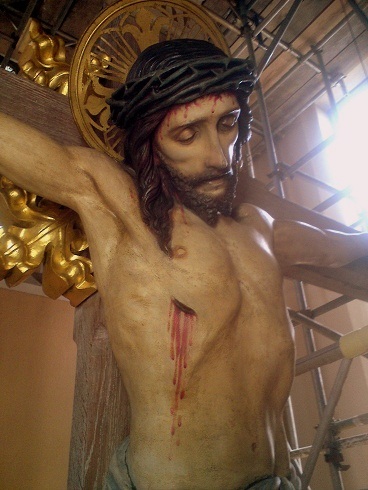 After completing the work on the ceiling we moved onto the crucifix. Again a thick layer of dust and grease was covering what was a beautiful piece of craftmanship. 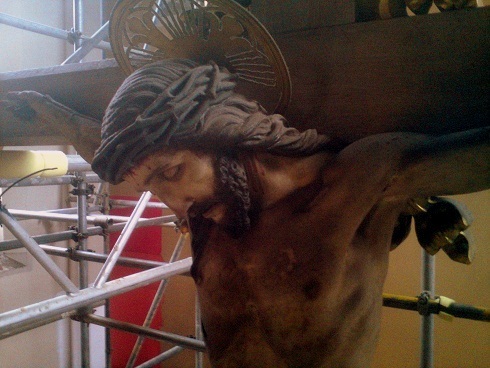 We undertook the necessary trials and set about cleaning the wooden cross and plaster statue. I must say that this is one of the more curious jobs I have done in my career so far.